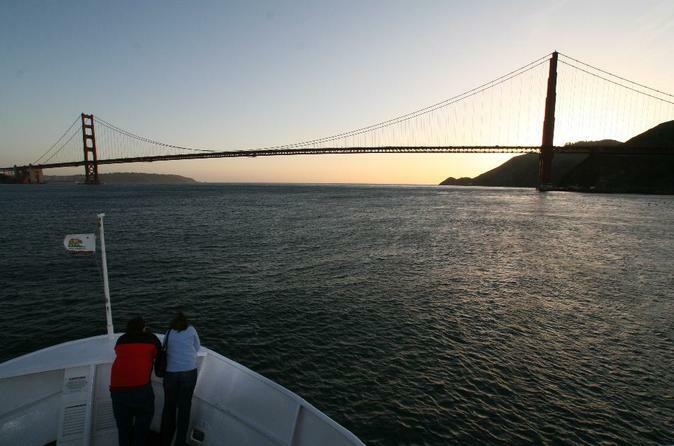 With live commentary by the captain and cool background music, this cruise is a wonderful way to explore San Francisco Bay at twilight during late March through early November. As the sun begins to set over the Marin Headlands, you'll cruise past Alcatraz, Angel Island and the shorelines of Tiburon, Belvedere and Sausalito. Watch the sun setting over the Pacific Ocean as you sail west toward the Golden Gate Bridge. On your way back to Fisherman's Wharf you'll see many more famous sights, including the Presidio, the Marina District and Fort Mason. During your sunset or twilight cruise, head to the light appetizer buffet to enjoy spinach puff pastry rolls; roast beef sliders; crudités and an antipasto patter; chicken curry wrap; sliced fruit and gourmet cheeses and a cookie platter. You can purchase more drinks at the full bar on board. All cruise vessels offer indoor and outdoor seating, and restrooms. There is no assigned seating or formal dress required, come as you are for an evening of relaxed sunset sailing! Vessels operate on bio-diesel, a renewable energy source. In the winter, the cruise changes its itinerary to make the most of the spectacular city lights view of San Francisco. As the sun sets over the horizon, you'll sail past San Francisco's modern skyscrapers, historic landmarks, the infamous island of Alcatraz and both the Bay Bridge and Golden Gate Bridge. Your evening of breathtaking San Francisco views will be accompanied with live guitar entertainment, hearty buffet of sandwiches, salads, dessert, and a beverage from the bar. Whether you are enjoying the skyline views from the ship's heated indoor spaces or out on the outdoor viewing decks, the city lights are an unmissable San Francisco attraction.